"Flllllllllyyyyyyyyy me to the moon and let me swing among the stars...." Yes, It's Movie Madness Monday's special Valentine's edition! Of course, we must mark the feast day of this mythological saint or saints with a lovely piece of romantic comedy. Here's the 411: I give you quotes, and you respond in the comments section with a quote or two of your own from the same movie. We do not name the movie, however, even if it is patently obvious, because some people have got no patents. I will out the movie next weekend. And I hope everyone has a wonderful Valentine's Day. Even the married people, like me, where I'm lucky if I don't end up cutting up someone's steak into chewable pieces. Ahh romance! At least Mr. Cornelius no longer considers a vacuum cleaner a romantic gift.... But enough about me! "If he eats one tiny piece of a nut..."
"My head swells up like a watermelon and I drop dead." "I don't think it could let a woman pay for dinner." "Great. They'll have a parade in your honor." "'I live in Tulsa.' Where is that?" "Oklahoma. Do you know where that is?" "I'm not going to think about what they're not teaching you in school. I am not going to think about it." "It is easier to be killed by a terrorist after the age of 40 than it is to get married--"
"That is not true! That statistic is NOT true." "It's not true, but it feels true." "'...and while we're on the subject, let's just say right now that Brooks Robinson was the best third baseman ever. It's important that you agree with me on that because I'm from Baltimore.'" I'm not too sure about the Brooks Robinson bit, since I'm awful partial to Mike Schmidt. But this is one of Nora Ephron's best pieces of work. Then there's Meg Ryan, Tom Hanks, Rosie O'Donnell, Bill Pullman, Rob Reiner, and Rita Wilson. Not to mention a cameo by Cary Grant and Deborah Kerr. And I didn't even make you go to the top of the Empire State Building! "Talk to her Dad. She's a doctor." "Of what? Her first name could be Doctor!" "Didn't you see Fatal Attraction?!" "Well, I saw it, and it scared the sh#$ out of me. It scared the sh%$ out of every man in America!" "Remember that dream where you're walking down the street naked?" I had to reread the first three quotes because they sounded so familiar. It wasn't until the last quote that I remembered what this was. Rosie O'Donnell should only be in movies this movie's main actor. That should read: Rosie O'Donnell should only be in movies WITH this movie's main actor. All her other movies aren't good. ". . .I cried at the end of "the Dirty Dozen." "She looks like my third grade teacher, and I hated my third grade teacher... wait a minute, she IS my third grade teacher! " "What did you just hear me say?" "Six girls in college, maybe seven." "Waiter! There's too much pepper on my poppycosh." Dearest Reflective Teacher: Right actress-- wrong leading man and movie! Try again! "She's a ho! My dad's been captured by a ho!" "I'll tell you what I'm doing this weekend, I'm getting laid. It's the 1990's and nobody's getting laid. I'm the only man in America who's getting laid this weekend and I haven't been laid that much. Six girls in college, maybe seven." Well, how long is your program? Well, it was a million tiny little things that, when you added them all up, they meant we were suppose to be together... and I knew it. I knew it the very first time I touched her. It was like coming home... only to no home I'd ever known... I was just taking her hand to help her out of a car and I knew. It was like... magic. 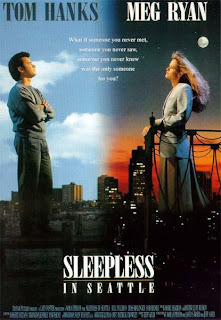 Watched Sleepless on Sunday and I could not believe how old I am suddenly. I don't remember that movie looking so dated. The old, old computer monitors with the black background and orange type. The old USA map with the silly dots signifying the flights across the country. The old Seattle Mariner's logo on the kid's backpack. I simply have to take my wife to the Empire State Building very soon. She's never been there.